These lists help me collect my mind, and possibly, by making these lists, I could buy less this month (already failed a few times). If you guys have any opinion on any of the items, whether you like them, recommend them, hate them, or what not, please let me know. 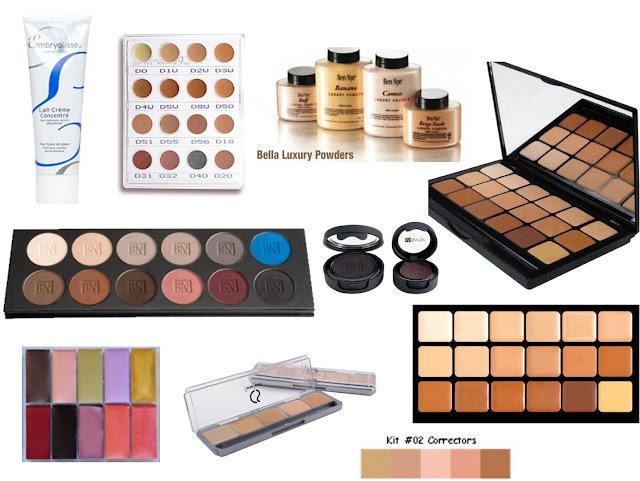 - all from Camera Ready Cosmetics, a site which sells professional 'stage' make up and ships worldwide. the price I quote is in USD. 5. Ben Nye Cake Eye Liner, $7 - can't decide on which shade to get, I'll definitely grab a black, but the browns and taupe look so nice to have too! the Kryolan ones are two dollars more, $9 each, are they different and should I get those instead? 8. Cinema Secrets, Ultimate Foundations Palette #Kit02, $24- I want more, but per shade, they are more expensive than the Graftobian... So I'm thinking of getting 1 concealer palette like this Kit 02, or 1 foundation palette with my shade... can't decide yet. Emma, I went to Paris 2 years 3 years ago. Searched high and low drugstore but the embryolisse shelves are always sold out of this stuff. So I guess I'll order it off some website :P Good luck with you. and enjoy your birthday/ Parisian trip!